Tammy Gangloff is an expert and leading authority on food dehydration. She is the face of, and the knowledge and information behind, Dehydrate2Store.com, a leading online resource in food dehydration education. A stay at home mother of four, she is a strong believer in self-reliance and home preparedness, and avidly researched and practiced food canning, freezing, and dehydrating. Most interested in food dehydration, and unsatisfied with the resources available to her to learn the art, she began dehydrating foods full time and developing her own techniques. With her four dehydrators running day and night, Tammy has attempted to dehydrate nearly every available fruit, vegetable, and herb sold in the United States. Tammy first gained widespread recognition through her instructional YouTube videos, and then through the development of Dehydrate2Store. She has since spoken on numerous talk radio shows and podcasts, and has been published in interviews in printed newspapers and online. 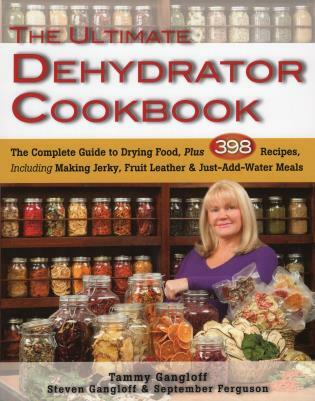 She has also led talks at preparedness expositions, and served as an expert Technical Editor for The Complete Idiotâ€™s Guide: Dehydrating Foods. Her fan base through Dehydrate2Store and YouTube includes tens of thousands of Internet followers, and a reach of millions of viewers in the United States and beyond. Steven Gangloff is a currently pursuing his MD at the University at Buffalo School of Medicine. He graduated top of his class with a degree in Biology and Chemistry with Research Thesis Honors distinction from SUNY Fredonia, and has extensive research experience in genetics and molecular cell biology at SUNY Fredonia and Harvard Medical School. Having additional interests in business, web design, and food science, Steven became the founder/CEO of Dehydrate2Store. Steven also served as an expert Technical Editor for The Complete Idiotâ€™s Guide: Dehydrating Foods and writes periodically and performs research and development, video direction and production, and site coordination for Dehydrate2Store. September Ferguson is a stay at home mother of 3 rowdy boys, and holds a degree in Fashion Technologies with interests in business management. Through her mother, September gained a strong interest in food dehydration, particularly in food processing, storage, and dehydration tools and equipment. September is also involved in recipe development and testing for the home food dehydrator.